This isn’t for the squeemish. The following is a detailed account of how I happened to be blessed with the 12 stitches depicted above. I believe I reported this incident in a previous (old) blog entry so if you read that one and find discrepancies, the old one was incorrect. While living in our previous home, it was determined that we needed to replace the kitchen flooring. The simplest way, for me, was good old peel-n-stick tile. As luck would have it, doing this requires proficiency in the use of a very sharp object to make cuts so tiles fit snugly around various obstacles. In this instance, I used a box cutter with a new blade. I had permission to do this because Diane was in the house, and Joshua, a foster child at the time, and an honorary Grandson, was helping me. He was about 10 at the time and Diane figured he could dial 911 as well as anyone if she wasn’t immediately available. Well into this project, there became a need for Diane to accompany our oldest Grandson to the local Urgent Care, leaving me and Joshua alone. They left in such a hurry that Diane didn’t have time to give me any instructions on how I should proceed with the project. Joshua and I conferred, and agreed that we didn’t receive specific instructions about NOT continuing. So, we continued. We had about 30 minutes of uneventful progress, and were on the very last piece I had to cut. Cutting, as I said, involved the box cutter and a steel framing square to ensure all the cuts were straight. I held the square down with my left hand, and had adopted a method of scoring the tile on the first cut, with light pressure, then doing another cut with more pressure. Safety was my primary concern. Really, it was. On that last cut I did the first light cut, then the second, and added a third for emphasis, kinda like an Ole’ move that the deed was done. On this third cut, the box cutter veered off the desired path, crossed a very short section of the square and connected with the tip of the pointing finger of my left hand. I swear to this day that is was like a laser guided weapon. Upon hitting the soft portion of my finger, the blade smoothly sliced into the tip of the distal phalanx of my left index finger. Since bone is very hard, the blade was forced upward, but it didn’t stop cutting. It sliced through the outer edge of my fingernail and continued toward the interphalangeal joint. 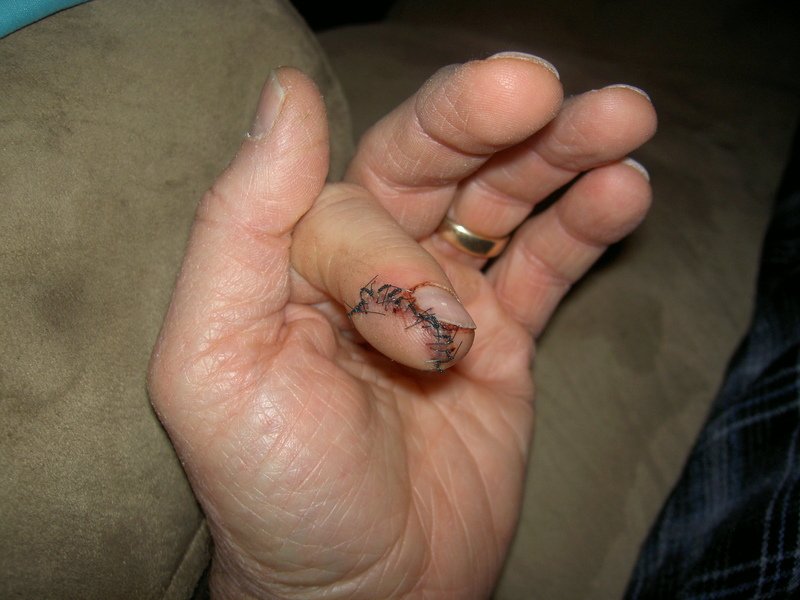 The joint deflected the blade away from my finger thereby avoiding further injury and the requisite stitches. All of this happened in less than the blink of an eye. Zip, and it was done. Immediately recognizing the pain of serious injury, I pinched my thumb against the wounded digit, and raised it above my head. This also happened very quickly because I was fearful of getting blood on the floor. Diane would have been livid had that happened. Joshua got a little wide-eyed at that point, and asked what happened. I went to the sink and held my left hand in front of me, still pinching very hard. But, I knew I had to look to confirm that the pain I felt was worthy of a trip to visit a doctor. I slowly released the pressure and blood gushed into the sink giving me all the proof I needed that, indeed, there was a trip to urgent care in my near future. I reapplied the pressure, rinsed the blood off, grabbed a handy dish towel, released the pressure, wrapped my finger and reapplied the pressure. That was quickly done, too, as I was to learn later. I told Joshua to come with me and we headed for my car. It’s really “our” car, but Diane let’s me call it “mine”. Fortunately, for Joshua, he had relatives who lived between us and urgent care, so I dropped him there, saving him from having to visit the waiting room. At urgent care, I got all checked in and patiently waited my turn. The pain was becoming excruciating, causing me to invoke the age old method of pain relief of sucking air loudly, and often, through my clenched teeth. My hand, of course, was planted firmly on top of my head. There was a little girl in the waiting room who appeared to become quite frightened by all of this, but she was saved from life altering trauma when I was called into the business end of urgent care. The nurse who escorted me to my room is a friend of Diane’s who’s name, oddly, is Diane. I was allowed to lay down and let my left arm rest on a handy table that was provided, and release the pressure on my finger. It was at this point I discovered the dish towel had hardly any blood on it which I knew would please my Diane. Nurse Diane didn’t care because she was more interested in the wound. She let it bleed for a little while, making sure all the little blood vessels were working OK, then she stuck a needle in my finger near the metacarpophalangeal joint. She did this numerous times, injecting lidocaine to numb my finger. It felt like my finger was swelling up as she did this so I looked. Indeed, it was swelling up to about twice it’s normal size. Then she got this really small, thick rubber band and worked it down my finger to the metacarpophalangeal joint. When she let go of the rubber band it cut off the blood supply to my finger and the bleeding stopped. My finger started turning white and she said she could leave the band on there for 45 minutes without killing my finger. While laying there, watching my finger die, my daughter, Jennifer, appeared in the doorway. This caused me concern because she tells her Mother everything. I was curious, too, to know how she had tracked me down. Lydia, daughter of Jennifer, was a Girl Scout at this time. Girl Scouts sell cookies and Jennifer was the Cookie Mom. Lydia had sold cookies to Joshua’s relatives, the ones I dropped him at on my way to urgent care. This was the day they were delivering cookies. When they arrived at Joshua’s location they were surprised to see him and more surprised when he told them that I’d cut off my finger. Jennifer went directly to urgent care and we had a nice little talk. Most of it was pleading with her to not tell her Mom what had happened. I knew, deep down, that, being a good daughter, the only choice she had was to rat me out. So, she did, but I didn’t immediately detect the ripple effect of that conversation. Now, every man knows that, when anyone uses all of his names, something bad is going to happen. In this case, it already had, but I knew there was great potential for things to get a lot worse. She had all manner of tools and sharp instruments at her disposal so I thought it would be prudent to do pretty much everything she told me to do. We started chatting and I learned that she was the doctor who treated my Grandson, and visited with my Diane during that process. Apparently Diane gave her enough background on me that she wasn’t at all surprised to encounter me this fine morning. I watched as she calmly stitched the flab of finger back into place. Two of the stitches were through the attached part of my fingernail making me admire the fine manufacturing abilities of whoever made such a sharp needle. When she was all done the ridges of my fingerprint were perfectly aligned. It was quite magnificent. Then it was time for the leak test. That’s when she cut the rubber band that was killing my finger. It was very interesting to watch the blood flow back into my finger, turning it back to a normal color. The stitches held nicely, and not a drop of blood escaped. I was released and sent home with a prescription for some pain killer, but I didn’t go get them figuring I better just get used to the pain. On the way I picked up Joshua and shared the story with his relatives. Once home, Jeff called to see how I was. He found out because after Jennifer called Diane, Diane called him, telling him to have me call her when I got home. Jeff and I had a fun conversation about being clumsy and accident prone, which we both kinda are. We laughed and enjoyed the moment. Soon, however, it ended with my promise that I would call his Mother right away, which I did. Her phone rang twice before she answered with, “Jerold Bradley Cate, what did you do?” She’s never been one who gently eases into a conversation. “What’s the bad news?” she replied. “I have 12, new, incredibly complex stitches,” said I, “and my new gloves will live to fight another day.” I added the part about gloves in an attempt to steer the conversation away from talking about the injury, but she tricked me. “You weren’t wearing them, were you?” she responded. This entry was posted in Sad But True, Stupid Stuff. Bookmark the permalink. Many years ago, but seems like yesterday. Or maybe last Monday.